Older adults aged 65 years and above are more vulnerable to problems related to heat and poor hydration. In a recent study done by the University of Chicago Medical Center. Seniors aged 65 years and above, accounted for about 40% of cases of the heat fatalities in the US. Sudden changes in temperature are not very well tolerated by our elderly loved ones. Furthermore, various medications and several ailments can affect the body’s ability to manage sweat and cause dehydration. It seems that the body’s natural capability to adhere to temperature changes is greatly affected due to advancing age. In addition, the body’s temperature regulation mechanism, paving way for dehydration as well as heat stroke. Which significantly increases their chances of suffering a heat stroke. 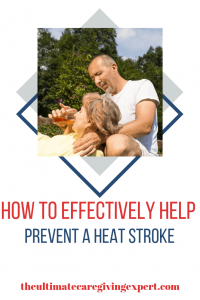 A heat stroke is a condition, characterized by a high body temperature, that rises above 103 degrees F within 10–15 minutes. The condition can cause death or permanent disability in the elderly if immediate action is not initiated on time. Heat exhaustion is another form of heat illness, but mild in nature, when compared to heat stroke. This particular condition needs mention here since we are discussing heat stroke. Heat exhaustion is equally important, during hot summer days. Elderly can even develop this condition, after several days of heat exposure and inadequate fluid intake. In view of this, it also becomes necessary to mention the various signs and symptoms of heat exhaustion. If your elderly is experiencing any of the following symptoms, then it is best to consult the doctor as soon as possible. 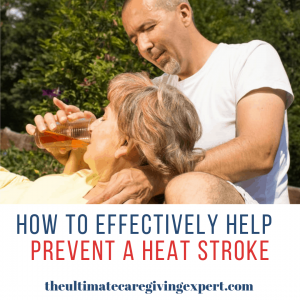 As caregivers, you should take careful note of all the above-mentioned symptoms of heat stroke. You also need to make your elderly aware of the said symptoms. So that they can adopt strategies to prevent dehydration. Lowering the body temperature is the key and for that, you would immediately need to shift your elderly to a cool place. If you do not have an air conditioner, then it is advisable to shift them to a place where such facilities are available. You can also think of keeping a wet towel handy for your senior, which they can use for lowering their body temperature. Secondly, you can also consider making use of cool packs, which can be placed on the head, chest, and neck to lower the body temperature. Give them fluids and salty snacks, that can help to correct the sudden fall in the electrolyte levels. Non – alcoholic, as well as non – caffeinated beverages, prove to be the best pals during hot summer days. Do not allow your elderly to indulge in any form of physical activity when they are experiencing such symptoms. If your elderly still does not feel comfortable, then it is best to seek medical attention at the earliest. Staying cool and indoors in an air conditioner is the best way to avoid getting exposed to the sun. 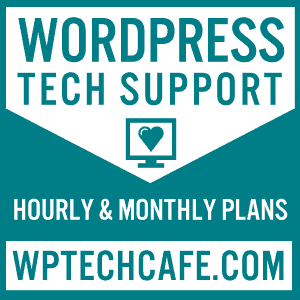 When the temperature outside is extremely hot, then a fan alone is not always sufficient to cool the room and you would need some additional air cooling systems. If your home does not have an air conditioner, then you need to contact your nearest health department or you can locate a home shelter with air cooling facilities. Make sure the elderly wear light-colored clothing. Dark colored clothing absorbs more heat and it is, therefore, always advisable to wear light-colored clothing whenever you move out. Light fitting clothing would also make your elderly comfortable in the hot sun. Staying well hydrated is very important to prevent a heat stroke. Drink plenty of fluids in small intervals. However, if your elderly is on fluid restriction, it is necessary that you contact the doctor on how much fluids to drink during summer days. Advise your elderly to rest as much rest as possible and don’t allow them to indulge in heavy or strenuous activities that would cause them to sweat. Do not allow your elderly to go out in the midday sun. Plan the day to run errands either before 10 in the morning or after 6 in the evening. In between, it is advisable to stay indoors. If you find your elderly is sweating and feeling hot, then ask them to take cool showers at least twice a day. Taking frequent baths during hot summer days. At least twice in a day, is a good idea, as it helps them to stay fresh and also helps in lowering the body temperature. Be aware of the signs and symptoms of heat stroke and exhaustion. If you find that your elderly is perspiring excessively, or his / her body has a high temperature and they seem to have a rapid pulse rate, or are having difficulty to breathe. Then it is advisable to contact the doctor immediately. As we get older, it is harder to stay cool. Follow the above tips and suggestions to help with the dog days of summer. Also, check out this post on thinning skin.